For anyone who believes that Africa is all desert and savanna, the Cape of Good Hope will dash all those misconceptions. 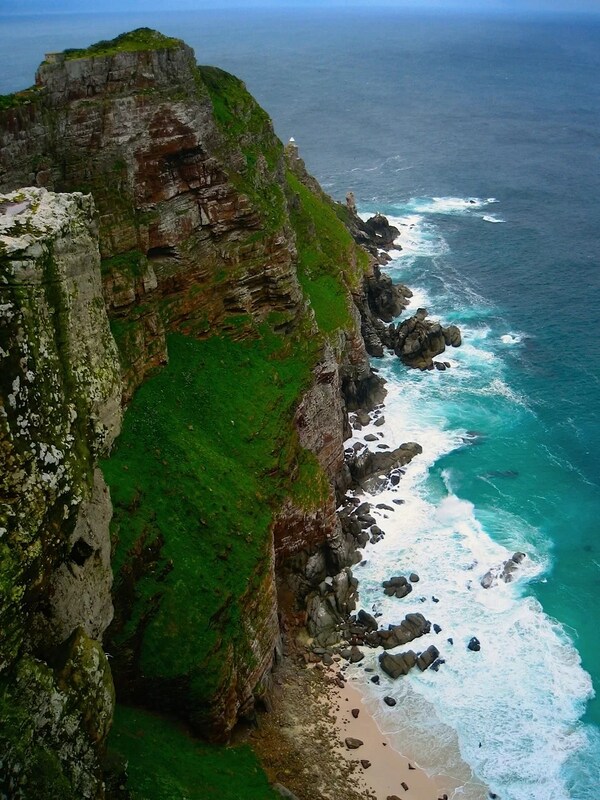 The Cape of Good Hope is about 50 kilometers south of Cape Town, South Africa. It’s lush, green, and rocky, with stunning vistas and cool, often breezy and unpredictable weather. 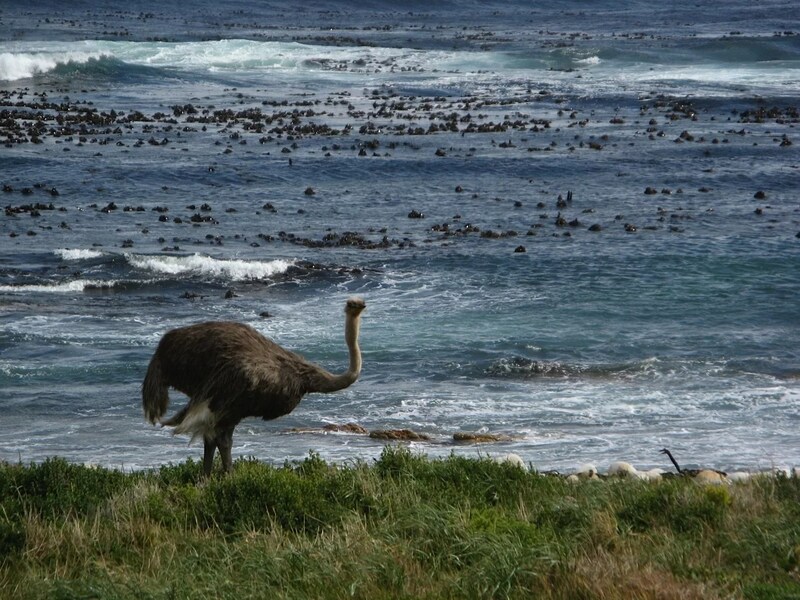 It’s an easy day trip from Cape Town and the drive is leisurely and scenic. If you don’t mind sharing the road with all the tour buses coming in and out, that is. Although the Cape of Good Hope is at the southern tip of the Cape Peninsula, it’s not, as many believe, the southernmost tip of Africa. That honour actually goes to Cape Agulhas, 155 kilometers southeast. But the Cape of Good Hope is an important waypoint for ships following the traditional clipper route sailing between Europe and the Far East, New Zealand and Australia. The route is often still used during yacht races. How would you like to sail through here? History: Bartolomeu Dias, a Portuguese explorer, was the first European to sail around the Cape in 1488. He originally named the Cape “Cabo das Tormentas” or “Cape of Storms.” (I guess the weather wasn’t favourable when he sailed around it). But King Juan II decided it should be renamed the Cape of Good Hope, with the belief that this route to India would one day become well-travelled. Unfortunately, sailing around the Cape was not without its hazards. Over the centuries, numerous ships fell victim to storms or hit the rocks around the Cape and sank. (It’s actually a great place to go wreck-diving, if that sort of thing is your cup of tea). Due to the hazardous nature of the Cape, they built a lighthouse here in the 1850s. Unfortunately, they built the lighthouse in the wrong spot. It turns out that they placed the lighthouse too high, so mist, fog and other general bad weather often obscured its light. Does the Lusitania ring a bell? The Portuguese ocean liner was sailing through here in 1911 when it ran into the rocks below the lighthouse and sank. The lighthouse was decommissioned soon after, and another one built lower down. Another famous ship you may have heard of is the Flying Dutchman. Although it’s existence is fully entrenched in nautical folklore, it’s said that the Dutch ship was lost off the Cape of Good Hope sometime in the 17th Century, and all on board perished. But occasionally the ship will still reappear in its ghostly form, often as a warning of some impending doom. Ever seen a beach ostrich before? Care to have a seat? 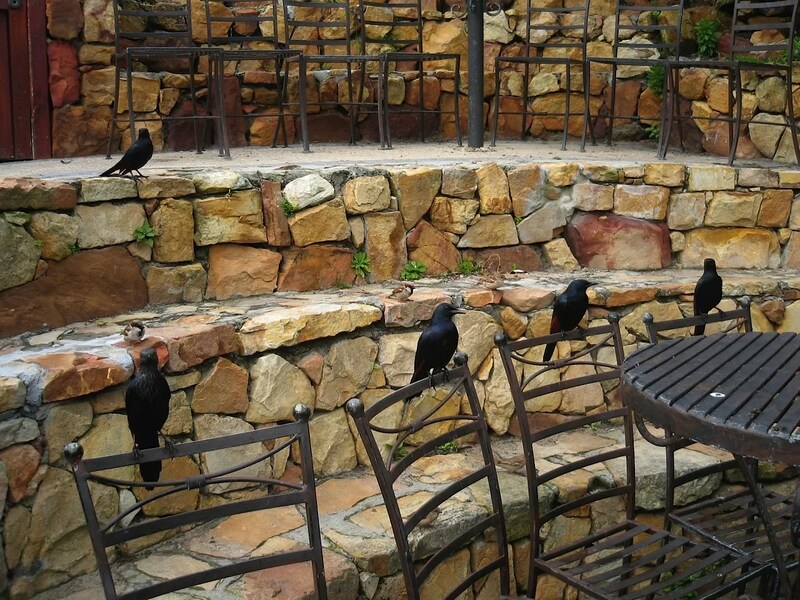 You can have our table after we finish our meeting. It’s a long, bumpy way down! The park boasts several hiking trails, scenic viewpoints, a funicular, and picnic sites. There are even accommodations if you want to stay in the area a little longer. 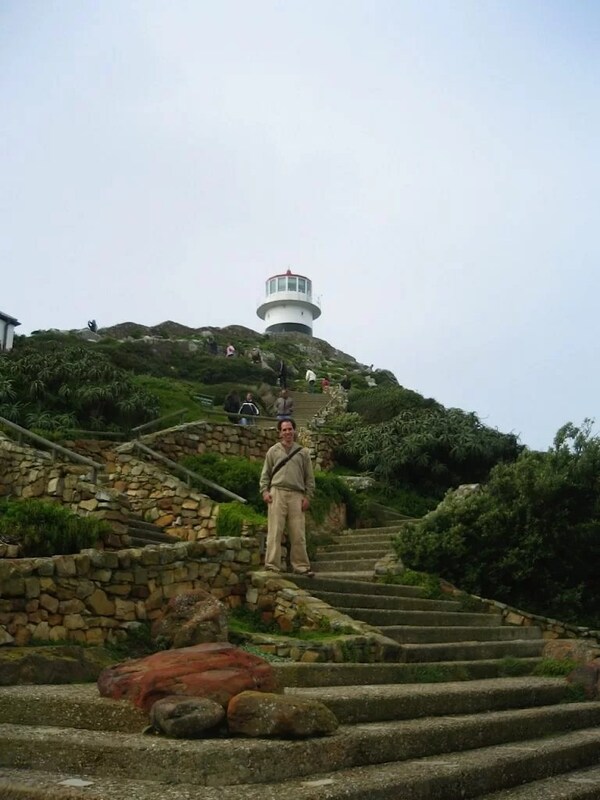 The Cape of Good Hope definitely has a lot to see and do. It’s well worth adding to any itinerary when travelling in South Africa! Check out the park’s official site to help with your trip planning here. 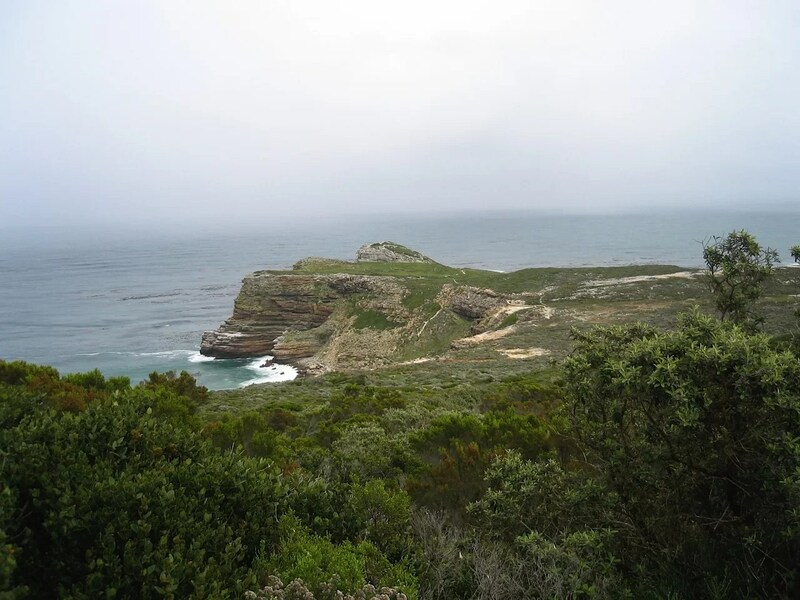 This entry was posted in South Africa and tagged cape of good hope, Flying Dutchman, Lusitania, South Africa by Darlene. Bookmark the permalink.